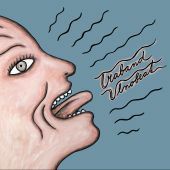 1995-1999 The main inspiration for the band name wasn’t only the legendary and popular car from GDR called Trabant, but there is a big resemblance here though: it’s noisy as hell and will shake up your bones. Two stroke beat, um-ca, um-ca, polka and pogo. But rather than Trabant the car, the flivver reeking of beer and humor of a cheap beer hole, it was Trabant in the original meaning of the word: a guide, an armed guard, life guard. Today, we would say a bodyguard. Someone in whose presence you can feel safe and at ease even though the storm or the third world war are raging all around. 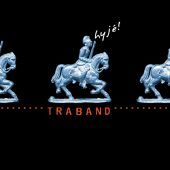 And of course, the word play is appealing: tra-band, triple-band, a band of three musicians. Because at the beginning they were three: Jarda Svoboda – songwriter, guitar, harmonica, mandolin and vocals, Michal Kliner – bass, Václav Pohl – percussion. A little later Evžen Kredenc, a banjo player, has become the “fourth wheel” of the band. And how about the music style? There are uncomplicated rock songs without self-centered guitar solos and with lyrics that tell stories. "The far side of country", "country-punk", "two stroke rock" – those are the tags their music earned. 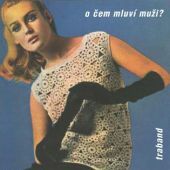 The first album called "O čem mluví muži?/What does men talk about? "(1997), contains some songs from the repertoire of previous Jarda’s band Otcovy děti/Father’s Children. 1999-2006 Somewhat primitive structure of first Traband was no longer sufficient for demanding music trips and so was the original punk two stroke converted into a dechno-klezmer-turbo-polka-cabaret five cylinder. New sound of the band was first marked by the engagement of trumpet player Jana Modráčková and little later by tuba player Robert Škarda. The bassist Michal Kliner left and the drummer was replaced (Petr Vizina replaced Václav Pohl) accelerating the transformation of sound from electric big beat to acoustic brass line-up (trumpet, tuba, clarinet, accordion, banjo, drums). Later it became known as “world music”, the band itself, however, found more suitable label for their style: “dechno” – dance music played by brass instruments. 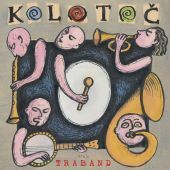 The album "Kolotoč"(2000) had great reviews but it took some time before the listeners got used to the “new” Traband. The band began touring abroad, first as a part of the projects of Theatre Na voru, then they continued by themselves (France, Switzerland, Germany, Slovakia, Austria, Hungary, Poland, Corsica, Greece, Japan). The songwriter Václav Koubek helped the band significantly back at home scene; the band started to play with him a lot as well as the actor Vladimír Javorský, a guest saxophone player at that time. With the arrival of bass flugelhorn player Jakub Schmid and the start of sampling techniques the possibilities of the brass band broadened. The slightly experimental CD called "Road movie"(2002) followed. The band changed the drummer (Petr Vizina was replaced by the original drummer Václav Pohl) and the band returned to a harder sound and to some songs from the first period of the band. The album "Hyjé! "(2004) summarizes everything what the band has gone through during its existence. The band received the Academy of Popular Music Award, the "Anděl 2004" in the genre of "world music" and the "Akropolis Live Music Awards" (ALMA) prize for the best live performance of 2005. They participate in many prestigious international festivals (Sziget, Rudolfstadt, Paris, Avignon, Danzig, and Strasbourg) and continue touring Czech Republic. Their ten-year musical journey “trabanders” celebrate with the big annual concert. 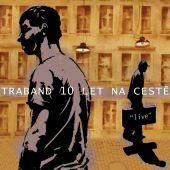 This concert is released on CD and DVD and it’s called "10 let na cestě/10 Years On The Road"(2005). 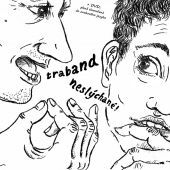 Along with the album, a non traditional songbook is released: "Kontraband", tales from their songs in the form of comics. After the celebration the band decided to take a year long break, relaxing time in the garage and the effort to redefine their current sound yet again. 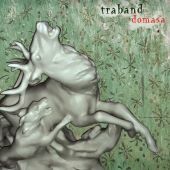 2007-2010 With completely new repertoire and new sound Traband started the third chapter of its existence and since early 2007 they begin appearing on stage again – first as “three-band” (Jarda Svoboda - harmonium, guitar, bass guitar, dulcimer, vocals, Jana Modráčková/Kaplanová – guitar, trumpet, harmonium, vocals, Václav Pohl – drums, beat box, vocals), later, in extended four member cast (Robert Škarda – tuba, sousaphone). Wild “dechno” temporarily recedes into the background and new songs express calmer lyrical waves. The key instrument that determines the sound is a pedal harmonium supported by colorful rhythmic embroidery of drums and guitar. After an omnivorous period when trabanders adopted almost any musical style comes an effort to look around their own country. 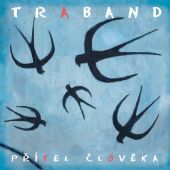 This new image of Traband is expressed in the album called "Přítel člověka/Friend of Man" (2007), for which the band received the Award of the Academy of Music “Anděl 2007” in the category of Folk & Country. Its harder and rawer follow up is so far the latest album called “Domasa“ (2010), which marks the band’s return to the rock format.